WordPress has always been a favorite platform for blogging. But while choosing a theme for your wordpress blog you often get confused. There are thousands of themes available for wordpress which are both free and paid. Today I’m unleashing top 13 best four columns free WordPress themes 2015. They are one of the most requested design features which we typically add to most of our WordPress photo themes. With a few small tweaks, you could adapt the themes to support any number of columns that you prefer. As always, the themes will work perfectly well for you as is, but the real fun is using them as a base for further development and customization. You may also take a look at our past collections for inspiration: WordPress Free Calculator Widgets, Grid Based WordPress Premium Themes, Free Related Posts WordPress Plugins and New Year Black and Yellow Nail Designs 2015. Imbalance 2 is designed in a strict modern style with a minimalistic touch. This theme can easily turn your site into an attractive blog, a portfolio, or even an online magazine. 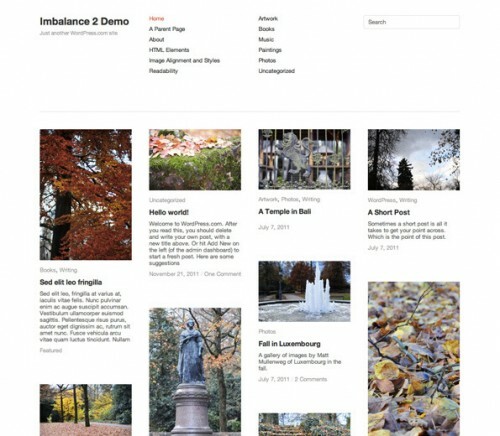 Imbalance 2 supports three widget areas, one in the header and two in the footer. The theme optionally allows you to promote sticky posts as featured posts and display them below a post in single view. 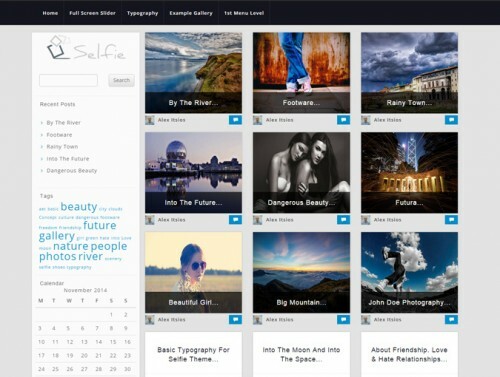 Photographer is a fully responsive WordPress Theme, mainly designed for professional or amateur photographers, designers, creative agencies and video bloggers. Photographer is built on Twitter Bootstrap Framework so it is viewed easily on every device. Special Media Queries eliminates visual bugs across devices. This theme is ready for WPML translation plugin. You can translate this theme using poedit as well. Simple theme is intended to provide a simple, clean, minimal layout from which you can develop your website. Fully responsive and based on the newest release of the Bootstrap 3 mobile-first, front-end framework, the Simple theme will transform effortlessly from desktop-width monitors to tablets and smartphones. Make’s flexible customization features and a powerful drag and drop page builder make designing your site fun and easy. Build almost anything: a simple portfolio or photography site, an eCommerce business site, a minimalist blog, or even a professional magazine. Tesla is a beautiful WordPress Theme with clean, modern, responsive design and some great features powered by a robust framework. It is a great choice for a blog, portfolio, business website, creative agency or any other related project. 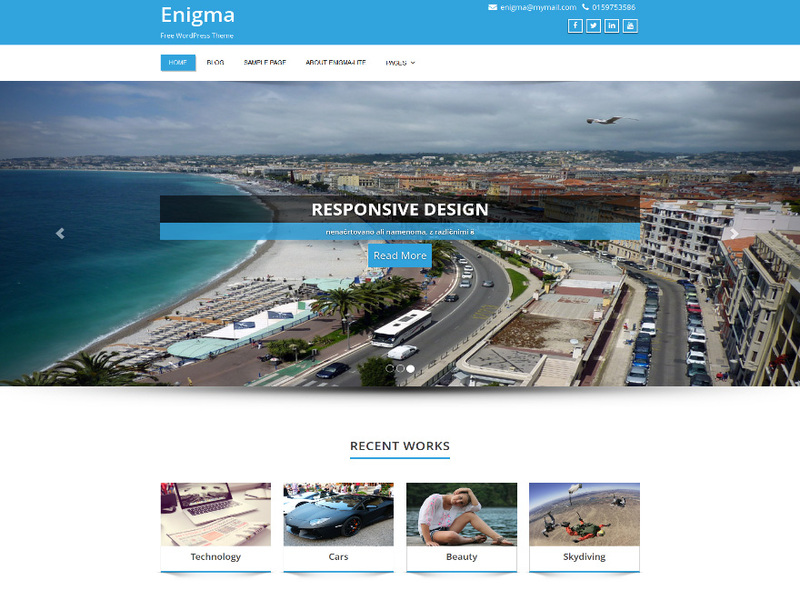 Enigma is an incredibly superfine multipurpose responsive theme coded & designed with a lot of care and love. You can use it for your business, portfolio, blogging or any type of site. Enigma is Responsive and flexible based on BOOTSTRAP CSS framework that adapts your website to mobile devices and the desktop or any other viewing environment. You too can gain more clients with Marketer – the premium quality responsive business theme! Features: Marketing focused design, 16 gorgeous skins, live extensive theme customize, unlimited color options, boxed and wide layout options, 600+ integrated google fonts with live preview, 12 widget areas. Careta is a full responsive theme configured directly by WordPress Panel Theme. The theme support: gradient footer colors, social icons with colors(in header or footer), display or not menus in header, colors for input fields, header and page image background, support author info box and custom colors for posts in home page. A simple lightweight and responsive WordPress theme designed for Business and Coprorates in mind. Weblizar offers a fullscreen featured image slideshow built using cutting-edge technology, lightweight assets, and offers featured image support. GridBulletin is a free, basic, clean, minimalistic, responsive, mobile friendly, WordPress theme in bulletin board layout. Grid layout on homepage and archive page, primary sidebar, 3 widget-area’s in footer, custom header-image, custom background, display logo or blogname and description, full width page-template and dropdown navigation are included.